Configure commerce transport file/HTTP for to avoid writing order XML to file system.!! Instructions to configure with HTTP transport instead of File are below. Please note you'll have to change the hostname for each environment in this end-point. If you'd rather just use the File transport, you could point the files to /dev/null (Unix Env) so the order data isn't written to a physical disk location. I am sure there is a way to do that in windows but you can also alternately use HTTP transport and do the steps below. 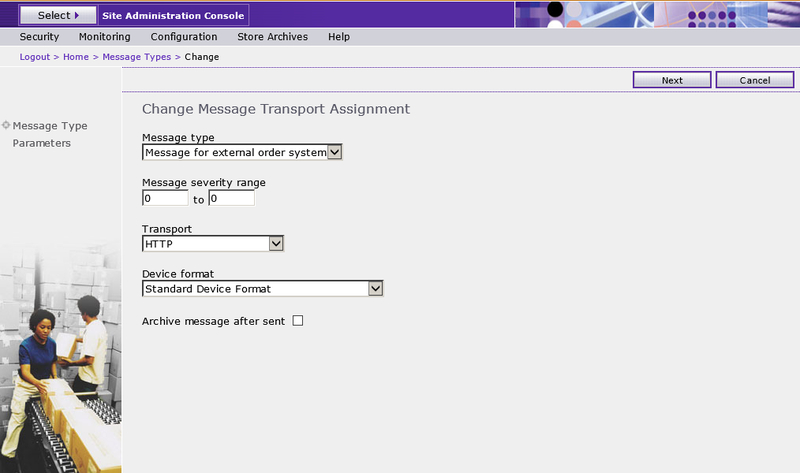 This screen in commerce administration console is used to select the out of the box out bound message (Message for external order system) . Click the check box and select change. Solr debugging links and refefrences. - This site allows you to copy and paste the SOLR debug xml and generate the explain report for you. - From Solr Wiki, this chapter explains the WordDelimiterFilter that fix my issue. - Again from Solr Wiki, this chapter gives the overview of Analyzers, Tokenizers and Token Filters. - Khai’s personal wiki page with good SOLR material. If you want to display a JSON of the CatalogNavigationView to be displayed in the JSP to view the details of all the attributes if you are trying to verify something, try this inside HTML comment and add the corresponding object name. It works.